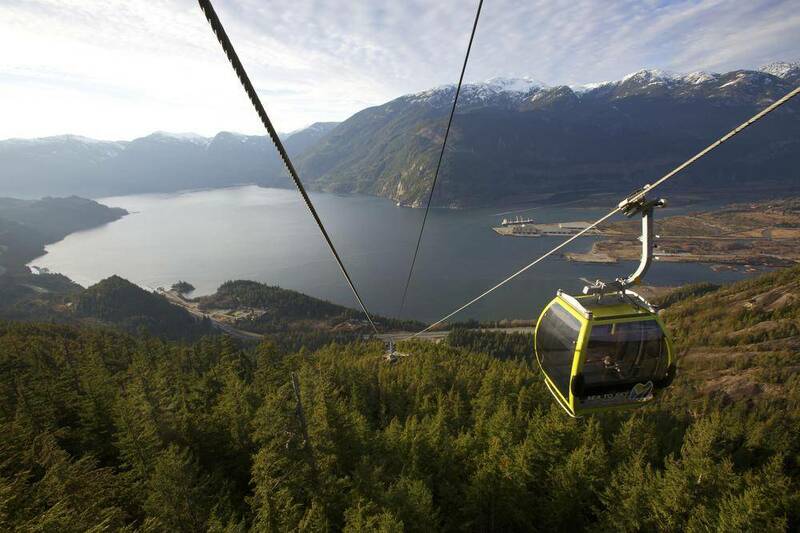 High atop the Sea to Sky Gondola, the hills are alive with the sound of … backhoes? With less than three weeks to go until its May 16 opening, dozens of construction workers are digging, drilling and hammering final touches into place. Just off the Sea to Sky Highway in Squamish, B.C. – the self-proclaimed Outdoor Recreation Capital of Canada – the 2,135-metre-long lift climbs the Sky Pilot massif in spectacular fashion. 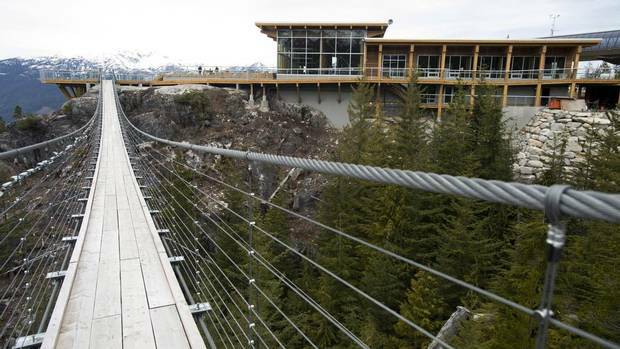 There will be wining and dining in its Summit Lodge; a tidy network of alpine walking trails and a 90-metre-long suspension footbridge are already in place at the top. From the enormous sunset-facing patio, one of three panoramic viewing platforms, I gaze up at Sky Pilot Mountain’s horn-shaped peak as it tears clouds to shreds, while Howe Sound glitters in the forested fjord nearly a kilometre below. It’s enough to make even Tyroleans envious. 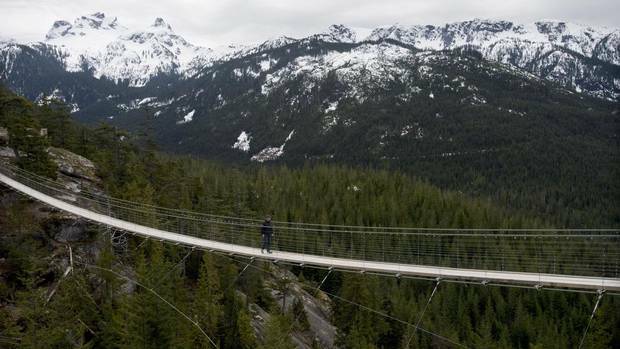 First proposed in 2011, the gondola required approval from four different sources, as it occupies municipal, Crown and First Nations land, and runs through Shannon Falls Provincial Park. 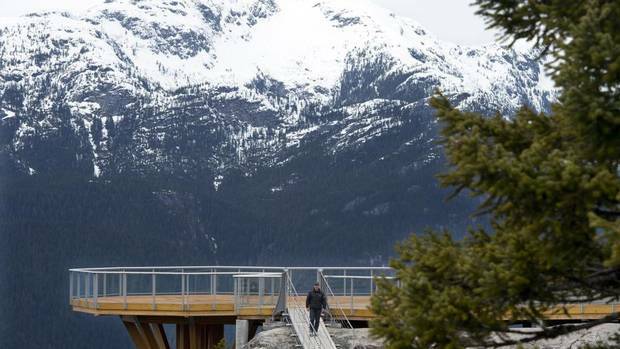 After much local consulting over the nature and purpose of the project – and considerable controversy over mistaken perceptions that it would run up the Stawamus Chief, the iconic granite dome that looms over Squamish – construction began last March. It all came together with “remarkable” speed, Faulkner says, because locals clamoured for something more than another roadside attraction. They are an active, outdoorsy bunch, as evidenced by the wide array of diversions – rock climbing, mountain biking, kayaking, kite boarding and so on – that gives the town its motto. Most of those motorists, he concedes, are on the way to Whistler, one of North America’s largest mountain resort areas. But the gondola has no interest in emulating the former Winter Olympics site. “Fundamentally, Whistler is a ski resort. 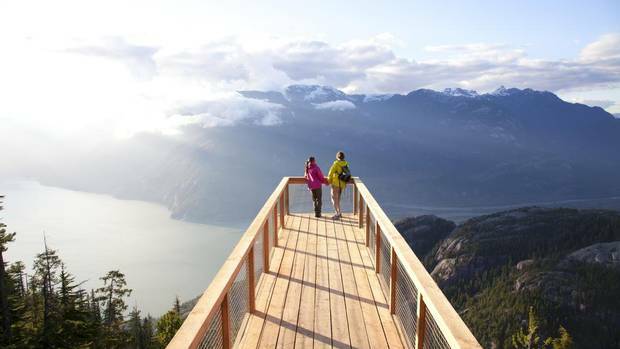 The Stawamus Chief viewing platform is fashioned from blond pine, and framed with glass panels; it’s a bridge to oblivion that soars over its namesake monolith, and yields vistas stretching all the way to Whistler, an hour’s drive north. The writer travelled courtesy of Tourism British Columbia. It did not review or approve this article.